I guess it was back in the early eighties when Billy Palmer decided to drain his lake and dig out around the banks. It was a classic East Texas farm pond, with one exception, the cows didn’t have access to the whole lake. It had all the classic features. Stumps, blow downs, mossy edge and an old dock. You could make it out about half way but the rest was rotted boards and a few poles. Great for dragging a big worm by or speeding a spinner bait through. I had fished this lake for the last thirteen years. My big bass was an 8 something, we didn’t have scales back then, but we were usually pretty close. I had tangled with some bigger bass than that on this old pond. I remember when Billy asked if I wanted to help him drain the lake, with his son Dirk and Kyle, I was all over it. I asked if I could bring a fishing buddy along that had been on the lake before, and he said sure. I knew Doug Flatley, one of my best friends, would kill to see what came out of this old pond. We met up that weekend and headed out. At that time, I still lived on the family farm about 5 miles from the Palmer place, back in the Cedar Yard community, this was about 15 miles off the main road to town…the “sticks” as we called it. After surveying the place with Billy we set up a 10HP pump on the dam. Running 50 foot of 4 inch rubber hose we scurried down the muddy creek behind the dam. It was steep too, the deepest part of the lake was close to 25 foot, which was pretty deep for a farm pond back then. When we got back to the top, we were ready to drop the other end.We had fashioned a sucker net over the end of the hose. Once we were at the deepest part, so we thought, we lowered the hose and tied off an anchor and float gadget to keep the hose off the bottom. Back at the shore, we started the pump. Well, it was a slow boat to China from this point on. We hung around and waited for the water level to drop but it didn’t. Seven acres is a ton of water, I am here to tell you. So, we dreamed of what was to come. What would we do with these monster bass? How would we catch them? Would we just wade out and net them? What kind of catfish would we find? The next day we hit the pond at sunup. Not much change. Dirk had got up that night and filled the gas tank back up so we had been running 24 hours straight through. You could see the old water line but it still had a way to go. The only thing we noticed was …..snakes! By the time we had gone from the truck to the pump I bet we saw a half dozen blunt tails. I didn’t bother to mess with them as we were in a hurry to check the lake and the pump, but now that we knew where things stood, they deserved our full attention. I proceeded to charm them the next 30 minutes with my 410. Now I was no stranger to snakes nor was Mr. Flatley, we had had our share of run-in’s with the cottonmouths, but these guys were everywhere, I bet we killed at least a dozen that day. We checked the gas late that afternoon and had formulated a plan for the next morning. Deciding that by the third morning, the water would be down to the point where we could just slide the 10-foot aluminum boat out to the remaining water, we would net the bass , like gold fish I a bucket. Then, we would transport the big ones to another pond near by, about half the size, and clean the rest. The next morning we had 12 gauge and charmer cocked and ready when our feet hit the ground. The sun was just coming up and it was about 80 degrees. Doug and I were in shorts and rubber boots, no shirts of course. We slowly walked up our path towards the dam. The sound of the pump still sucking down the water echoed through the woods. When we stopped at the edge of the dam and looked over the almost empty lake, there were bass everywhere…big bass too.The problem was that they were not in the water; they had flung them selves into the mud! We were distraught, in a desperate attempted to save any we could we ran down the dam and to the boat. With our gear ready, I got in first and moved back as far as I could, and sat my 410 down. “We don’t need that on the boat do we? ” Doug said. ” She goes where I go buddy” I replied. He waded into the mud. I was not sure this was going to work, so we just went for it. My push pole was about 16 feet and when I tried to push it down through the mud and shove off at the same time, well it was like a hot knife through butter, I don’t think I ever hit bottom. It all happened rather quickly, as things of this nature do, but when Doug had pushed me off, I did in fact slide out about 6-7 feet and then stopped dead. At that very moment I kind of slipped forward and fell in the boat, at the same time I saw that Doug had sunk up almost to his arm pits in the mud from when he had pushed me off…and not 5-6 foot in front of him…. was a huge cottonmouth, right on the muddy surface. It had been under the boat the whole time, stuck in the mud. When I jumped in I must have pinned it down…. In what seemed to be slow motion I grabbed the 410 and jumped for the front of the boat…… I stood, aimed and fired all within a few spilt seconds. The very next thing I hear is Doug cussing me out, his face covered in Mud, asking me what the heck I was doing? I pointed to the 3 foot viper that lay not 6 foot in front of him that was blown in half…his profanities turned from me to the snake. We exited the boat, lake, pump and the snakes for a quick wash off at Billy’s house and to reflect on what just happened. Knowing I had “snake shot” loaded and as close as I was, there was little chance that I would pepper Doug, but it was still scary. That old blunt tail was mad and Doug didn’t have a chance in the thick mud….it would have nailed him without a doubt! We ended up killing another dozen snakes that day and collected as many bass to ten pounds, all had died. Apparently, they banked themselves looking for oxygen, regardless, I hated to see all those bass go to waste. 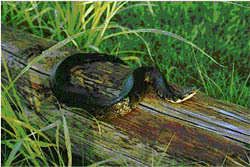 On the other hand, Mr. Palmer said he didn’t see many snakes after that around the pond. He dug the banks out and the lake filled the next year, although it would take a long time to come back. Doug and I still fish together any chance we get and sometimes we think back to that scary summer morning and that monster blunt tail….. and he always says to me …” Man oh man, I am sure glad you decided to keep the charmer on board that morning”….. I was glad too!